Taking care of your teeth is important year-round, but it’s especially when there’s likely to be a big influx of sugar into your life. With that in mind, let’s take a look at alternative dental care options to help keep your whites pearly, your gums healthy, your breath fresh, and the overall state of your oral health in tip-top shape. Just as you’re choosy about the personal care products you use for your hair, skin and nails, it’s best to inform yourself about what’s inside the toothpaste, floss and brushes that you use. After all, think about how often you use these items! Before talking about specific toothpaste brands, let’s take a look at fluoride, an addition to most mainstream toothpaste products. Fluoride is the negative ion of the element fluorine, and can be found in trace amounts throughout nature. Fluoride helps to mineralize teeth, making them strong and more resistant to cavities. Many cities and townships through the U.S. have fluoride added to the public drinking supply, a practice that’s been around since 1945. And, while this has helped to improve many peoples’ dental health in regards to cavities and tooth decay, fluoride in the public drinking supply has caused concern among some consumers. Though fluoride has been endorsed by many national and international health agencies and dental associations across the planet, including the American Dental Association, as safe and effective, skepticism persists among alternative audiences about the safety of the compound when consumed in large doses. Some European countries have discontinued the practice of adding fluoride to drinking water, and the decision to keep it in the water in the U.S. has caused some controversy among citizens and organizations that consider it a form of mass medication. Fluorosis, a condition that can affect teeth and bones, is one concern. Dental fluorosis, in its mild state, can appear as white spots on teeth; more severe cases involve the browning and weakening of teeth. Skeletal fluorosis in its early stages shows symptoms of stiffness and joint pain and altered bone structure and calcification of ligaments in its more advanced stages. Both of these conditions are very rare in the United States. While there is no conclusive evidence, some scientists insist that there are other potential health risks to consuming fluoride over a long period of time, including weakened bones, types of bone cancer and impaired brain development. The choice to use fluoridated dental care products is a personal one, and Kimberton Whole Foods supplies both fluoridated and non-fluoridated products to ensure that all of its shoppers can find what they’re looking for. The top-selling toothpaste at Kimberton Whole Foods is Dr. Bronner’s Peppermint All-One Toothpaste. This product is scored a 2 on the Environmental Working Group’s Skin Deep rating system (1 is the best rating), and is made from 70% organic ingredients. The low-foaming formula contains no synthetic detergent foaming agents, is fluoride-free, vegan and cruelty-free. It is also free from all artificial colors, flavors, preservatives and sweeteners. 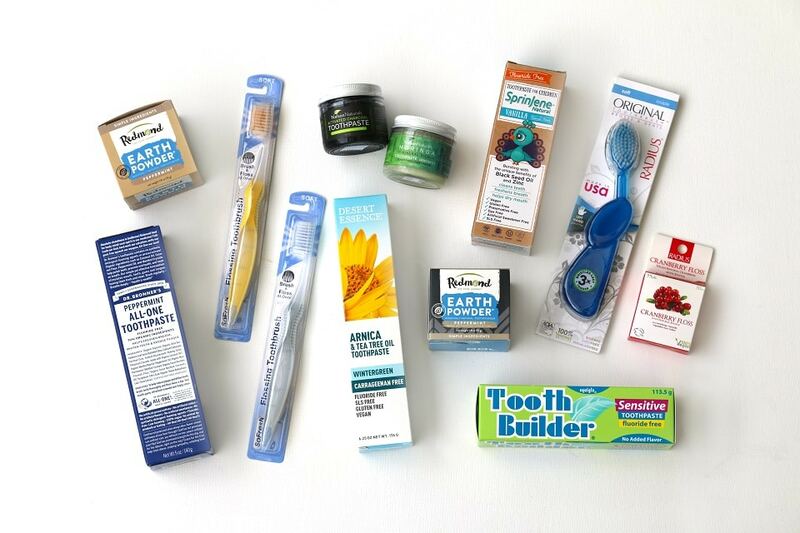 Bonus: Both the tube and the box the toothpaste comes in are 100% recyclable. The same formula also comes in Cinnamon and Anise flavors. Folks with sensitive teeth or other issues, such as canker sores, gum disease and mouth ulcers, will be glad to find Squigle’s toothpaste on the shelves at Kimberton Whole Foods. This local brand, from Narberth, Pennsylvania, has been making products since 1998 specifically to help people who suffer from oral pain. Its toothpastes are free of harsh abrasives, stinging flavors, irritating tartar control agents, bleaches and sodium lauryl sulfate (SLS), which can be highly irritating (more info here). SprinJene Natural Cavity Protection Toothpaste: Made with black seed oil (nigella sativa) and prized for its immunity and digestive support, infection and inflammation-fighting properties and so much more, this toothpaste is vegan, gluten-free, Kosher, Halal, cruelty-free, and free from SLS, dyes, preservatives and saccharine. SprinJene, which is based in Piscataway, New Jersey, is an entire line of products designed by a PhD scientist with a long career in oral health. This specific product does contain fluoride, but other products made by SprinJene, including toothpaste for children, do not. Desert Essence Arnica and Tea Tree Oil Toothpaste: If you’re familiar with homeopathic medicine and holistic personal care, you might already know of the reported benefits of arnica and tea tree oil. In this product, arnica and myrrh help to sooth any soreness in the mouth, and Australian tea tree oil defends against sugar acids; baking soda and sea salt are gentle cleaning agents for the teeth. This minty-fresh toothpaste doesn’t contain many products that some consumers try to avoid, like SLS, phthalates, sugar, alcohol, parabens and animal-derived ingredients. It is carrageenan-free, gluten-free, fluoride-free, non-GMO, vegan, recyclable and biodegradable. Made in the USA from renewable globally sourced ingredients, this product (like everything made by Desert Essence) is not tested on animals. Nelson Naturals Activated Charcoal Whitening Toothpaste: Not all toothpaste comes in a tube! 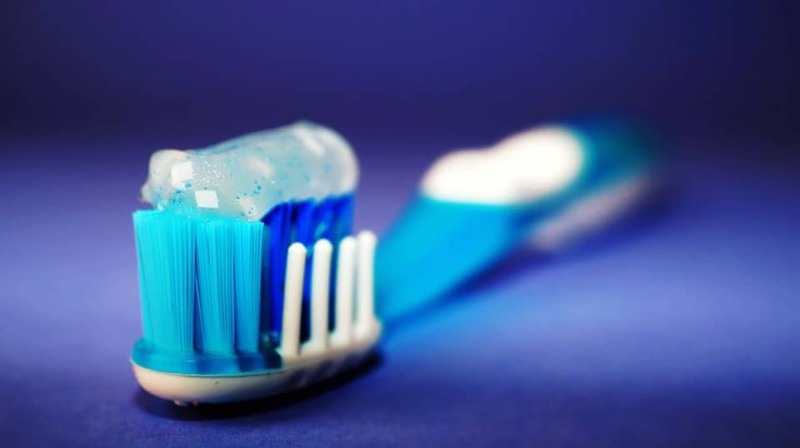 There’s been movement among some natural personal care brands away from tubes to tubs — the toothbrush is gently dipped into the tub or jar to adhere the toothpaste to the bristles. One popular example at Kimberton Whole Foods is Nelson Naturals Activated Charcoal Whitening toothpaste. Activated charcoal, another trend-forward ingredient, is believed to detoxify, it can also help to whiten teeth by drawing out plaque, bacteria and tannins that may stain teeth. In place of chemicals, like sodium fluoride and sodium lauryl sulfate, Nelsons Naturals uses food-grade ingredients, like almond oil, calcium carbonate, sodium bicarbonate, xylitol, sea salt, and colloidal silver. According to the manufacturer, this product is safe for children to use as soon as they have teeth! Another example of toothpaste in a tub or jar is Redmond Earth Powder, which also contains activated charcoal to clean, remineralize and alkalize teeth. Its minty, fresh flavor is made without any sweeteners, fluoride, foaming agents, coloring or glycerin. The vegan, gluten-free and all-natural toothpaste contains simple, pure ingredients, such as bentonite clay, non-GMO xylitol, sea salt, activated charcoal, peppermint essential oil and menthol. 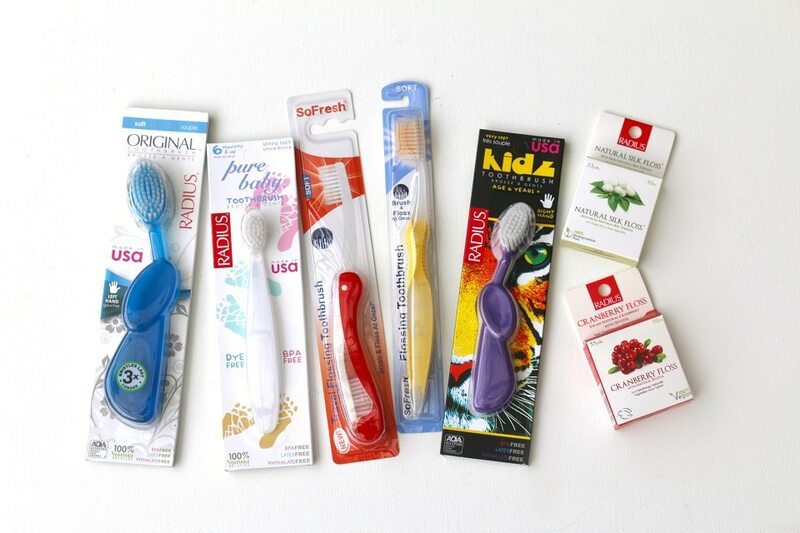 The Oramedix flossing brush from SoFresh is the best-selling toothbrush at Kimberton Whole Foods. This innovative brush features soft flossing bristles that clean between teeth and under gums, a sleek, ergonomic handle, and it is available in a range of colors. It’s not meant to replace flossing, but to enhance a regular flossing routine. The bristles are made of a plastic material called PolyButylene Terephthalate (PBT), which, because they absorb less water, lasts longer than normal nylon bristles. SoFresh also makes kids’ toothbrushes, as well! A great local company making toothbrushes is Radius, based in Kutztown, Pennsylvania. Its uniquely-shaped brushes, which earned a spot in the Smithsonian Institute National Design Museum’s permanent collection, are made in right- and left-handed varieties. Plus, they are 100% petroleum free: The cellulose handle is sourced from renewable timber and the nylon bristles are vegetable-based nylon bristles. The wide, oval brush head with soft bristles provides a superior cleaning experience, and the handle design complies with the dentist-recommended 45-degree brush-to-tooth angle. Smaller brushes are made for babies, tots and kids; travel sizes and replaceable head models are available, too. Sustainable and natural dental floss is also manufactured by Radius. 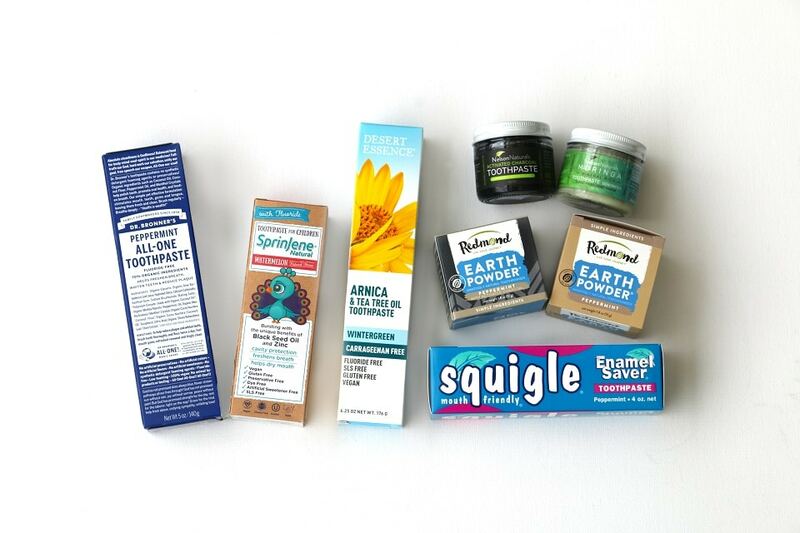 Head to your local Kimberton Whole Foods location to check out even more natural dental care products to keep your mouth clean and your teeth and body happy! As always, the experts in Kimberton Whole Foods’ Apothecary department are happy to help with any questions or recommendations!